Trudy Ludwig has once again proven herself to be the queen of empathy. With The Invisible Boy, Ludwig and Patrice Barton gave us a picture book that I consider to be the absolute perfect tool for teaching your children how and why to care about others. Lucky for us, they’ve teamed up again to bring us another incredible story that will lead to our kids reflecting on how their actions might affect others - Quiet Please, Owen McPhee! This was during a class about teaching children how to read. The point was that lots of children grow up with significantly less exposure to words compared to others, and that it can make a big difference for their future reading ability. I walked away from this story about the grocery store desperate to be parent #1, but not for the reasons you might think. As a father, this story made a big impression on me for a different reason. The kid whose Mom just snaps at him isn’t just missing out on a vocabulary lesson. He’s also missing out on a lesson in empathy, showing someone that you care, and showing someone that you are listening. I think it’s fair to say that my kids are growing up in a very different world than I grew up in. I don’t think it’s a groundbreaking statement to suggest that technology is changing the ways our children’s social skills develop. Children have always needed to develop their executive functions and their listening skills and their ability to pay attention and control their impulses - but I don’t think it’s a stretch to say that it’s more of an uphill battle in today’s world than it used to be. And part of the problem is that many of their role models have their noses in phones just as much as they do. So how do we teach kids to pay attention and listen? Well, being a good role model certainly has to be a part of it. And, assuming we take care of setting a good example first, I’ve always found stories to be one of the very best teachers of life lessons. If your kids are anything like my son, they often want to know the “why” of a lesson - as in, “why do I need to listen?”. A well-crafted work of art that appeals to their heart not only answer their questions, but it can cause them to reflect on their lives and leave a lasting impression as well. Quiet Please, Owen McPhee! is the work of art for this life lesson. 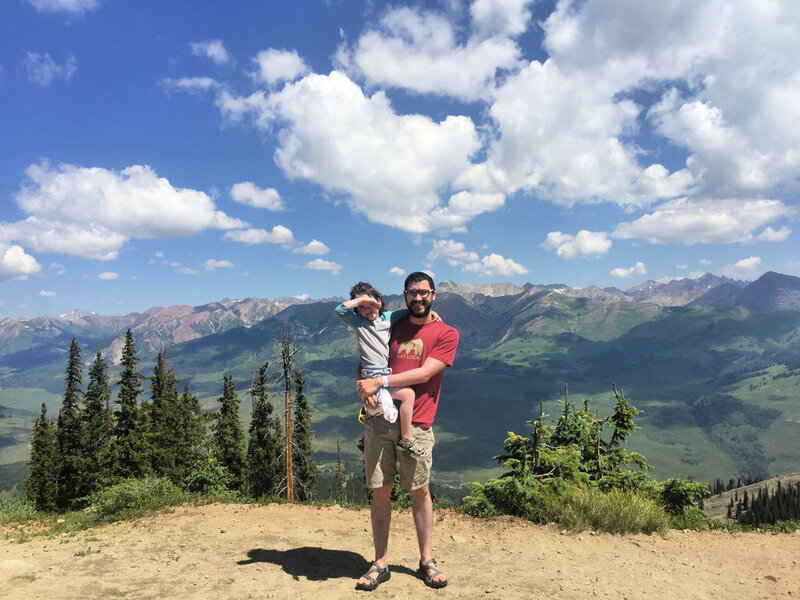 As a dad there are many things I want to teach my children. Most of all, as my son’s teacher can attest, I want them to be kind to others. Skip the summary about the math and English grades, we’re in kindergarten here. Just tell me if he’s being nice to everyone. Next up on my dad list is stoking the fires of a magical childhood imagination. There’s nothing more beautiful and joyous for me as a dad than experiencing the curious, creative, and excited personalities of my children. 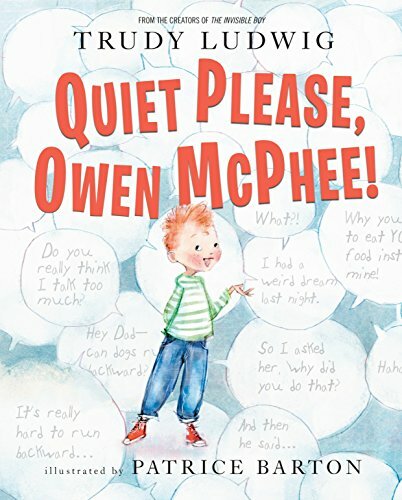 The interesting thing is - all of those positive qualities seem to describe the title character Owen McPhee in Trudy Ludwig and Patrice Barton’s newest picture book. Owen strikes me as a kind-hearted and well-intentioned boy, and he is very clearly excited about life. He simply wants to share all of his thoughts with everybody all the time. He has lots of random knowledge he wants to share with others, and he asks a lot of questions too. In a lot of ways, that sounds exactly like my son - and oftentimes his excitement and desire to share his ideas is a beautiful thing. So why does everybody want Owen to be quiet? I think that it’s important to quickly distinguish the difference between asking a child to be quiet all of the time, and asking a child to be quiet some of the time. Quiet Please, Owen McPhee! is a story about balance, and a story about wisdom, and, once again, ultimately a story about empathy. The big problem is that all of Owen McPhee’s talking described in the book comes at inopportune times, and negatively affects those around him. In science class all of his talking gets in the way of listening to the teacher’s instructions, and this leads to Owen destroying another group’s project. During reading time he keeps shouting his ideas for what’s about to happen in the book they’re reading. And in the cafeteria, despite the cries of his classmates, he spoils the end of a new movie for everyone. Owen receives his important lesson on balance and empathy, however, when a case of laryngitis forces him to experiment with being silent. When I ask my son’s teacher at parent teacher conferences if he is nice to everyone, I’m not merely talking about the absence of malicious intent. You don’t have to have malicious intent to hurt somebody’s feelings or make them feel less important. You can be a cool, creative kid who’s really smart and kind - and you can still hurt someone by not letting them talk and not listening to them. The wonderful thing about this story is that it’s not merely a warning of what not to do. This book empowers us all to make a difference through action as well. By actively and purposefully listening to others we allow them to express themselves and feel heard. And that’s why Ludwig is the queen of empathy. Just like we did after The Invisible Boy, I find myself reflecting with my son about how we can help others feel seen. It always comes back to kindness - just like it should. Have you read either of Trudy Ludwig and Patrice Barton’s collaborations? How do you teach your children the importance of listening and allowing others to be heard? Let us know your thoughts in the comments. Disclaimer: A copy of Quiet Please, Owen McPhee! was gifted to us by the author - with no expectation of a review. All thoughts and opinions are our own.